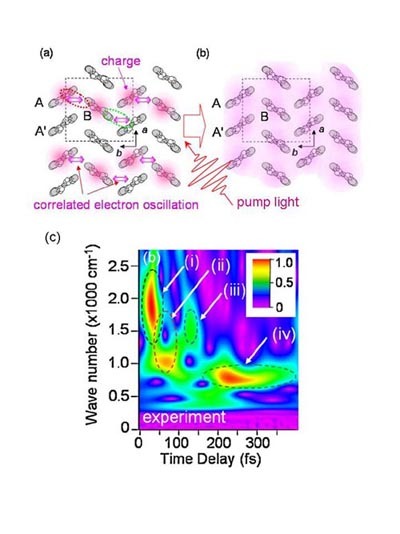 Low temperature condensed state physics (Sasaki group) has successfully observed the first step of the photo induced metallization process from the charge-order insulating state of the organic materials by means of ultra fast optical spectroscopy under the collaboration with Graduate School of Science, Tohoku University and Institute for Molecular Science. The achievement would enable us to develop the ultra fast photo-switching device utilized by the photo induced phase transition phenomena in future. This work was performed as a part of the research programs of Japan Science and Technology Agency (JST-CREST) and Grant-in Aid for Scientific Research on Innovative Areas "New Frontier of Materials Science opened by Molecular Degrees of Freedom", MEXT. The research result was published in "Physical Review Letters" by American Physical Society (December 10, 2010), and was reported in a news paper of Kagaku Shimbun on December 3, 2010. (a) Charge order insulating state. Charges are frozen periodically on molecules. (b) Photo induced metallic state just after melting the charge order state by pump light. (c) Ultra fast variation of photo induced states with femtosecond (10-15 second) speed.